The secluded locations and the distinctive views make the cabins unique in themselves. They include: fenced yard( Ranch House Cabin), porches or decks, and a wooded seasonal creek lazily babbling by the window. And, there’s more to make your mountain retreat a lovely weekend getaway…or, maybe a memorable vacation. Crown King Cabins and Suites offers comfortable accommodations, each with that special touch you only find in a quality, family owned business. Just a few of the many amenities are fully equipped kitchens, private entrances and decks, tastefully decorated accommodations with private baths, quiet enjoyment , amazing gardens and flowers for every season. Don’t forget to visit the “Iron Garden” (filled with everything metal I have found here in Crown King during my 45 year history here), Peek into “The Dynamite Shack” and get a look at the antique “Bottle Collection” on display. Enjoy and amazing meal at the newly renovated Mill Restaurant at the top of the hill. The Mill is serving lunch and dinner Friday, Saturday and Sunday featuring their “Famous Beer Bread open face sandwiches, Savory ribeye steaks, etc.. and the beautiful array of hummingbirds and wildlife while you graze on the most amazing fine dining with a rustic flair. The Prospector Smokehouse and Grill is also open for breakfast and lunch featuring Smoked Brisket, Pork Shoulder, Ribs, Chickens and of course the specialty Bacon. Lets not forget about the M J Cafe located inside the Famous Crown King Saloon. Juicy Burgers, hot fries and Specials. The Crown King Cabins, Suites, and Bunkhouse, (formerly Bradshaw Mountain Guest Ranch) is the vision of The Woodward and Paccioni Families. My father, the late Pastor Dan Woodward of the Chapel of the Crowned King, began venturing to Crown King in the early 1970’s in our vintage jeep up the “back roads from Lake Pleasant” when the remains of the Orabelle and Tiger Mines were still evident. We were called “Jeeper’s”. My family loved the Southern Bradshaw’s and the majestic pines so much they bought and built a cabin in the “Acres” and we upgraded to “Sloper’s”, ( a term Crown King locals use to describe “Summer Cabin Owners”). We spent every weekend here and eventually my parents bought the Crown King General Store. I married my husband here and began our family. Three of my 5 children were born here in Crown King, including Dimitri Dante, who now lives here and continues to create a “new vision” for the Historic Town of Crown King commonly known as “a little town with a heart of gold”. We continue, as a family, to develop on our vision everyday, towards what we want to be the most premier property in Crown King in the Southern Bradshaw’s for our most loyal visitors. We continue to work daily on site, and we are now developing and improving the Crown King Event Center for future visitors, tourists, and guests to enjoy. The Event Center offers a “park-like setting”, with lush lawns and gardens, an outdoor rock stage, 5 new regulation horseshoe pits, an outdoor fireplace, picnic tables, a massive gazebo, playground and so much more is in the works. The most beautiful backdrop for your special day. The Event Center is the perfect place and venue for Wedding Receptions, Family Reunions and Picnics, Fundraising Events, Horseshoe Tournaments, Corporate and Religious Retreats, and so much more. We have plenty of parking, restroom and shower facilities, and plenty of majestic pines and natural beauty to go around. At this time, The Crown King Event Center and Crown King Cabins, Suites, and Bunkhouse is the Southern Bradshaw’s most premier, one of a kind event venue and wedding venue. While we host unbelievable rustic weddings we can also host amazing receptions, parties and business luncheons and events, etc. 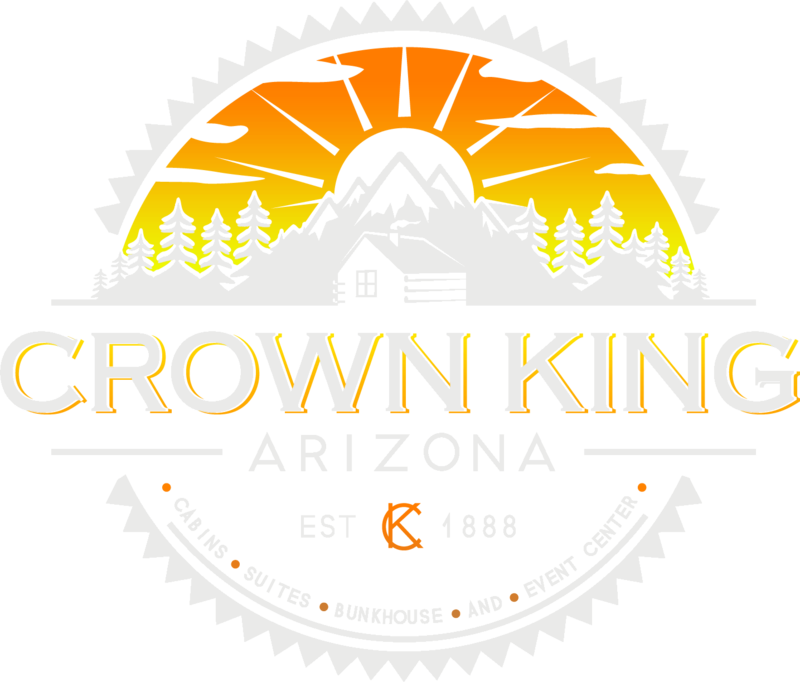 Thank you for taking the time to consider The Crown King Event Center to host your Event. The Paccioni’s are dedicated to creating a flawless event and party from beginning to end. We have valuable experience in hospitality, restaurant management, party planning and customer service excellence and will oversee these events personally to create that one special memory of a lifetime. It all starts with a tour of the property where we will fill in all the details, show you exactly what could be, and explain just how amazing we can customize your event of your dreams. Booking and planning an event does not get any easier and affordable. If you have a dream event in your heart, We can make it come true. If you have a budget we can try and customizing our packaging to make it happen. We pride our business on no hidden fees and/or agendas. 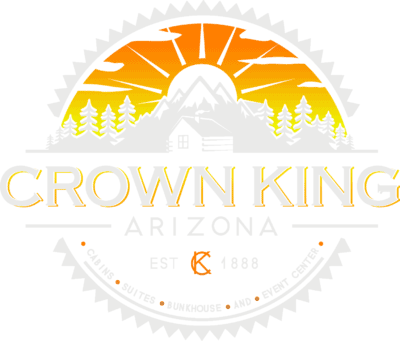 From the moment you choose Crown King for your Event or Wedding, you will know the bottom line. We will work with you diligently leading up to your special day, and allow you to make adjustments and changes. Take yourself, family and friends back in time to SIMPLE, NO DRAMA, NO STRESS, NO WORRIES, just a Great Time in the Great Outdoors. We would love to host and help create your one of a kind events!